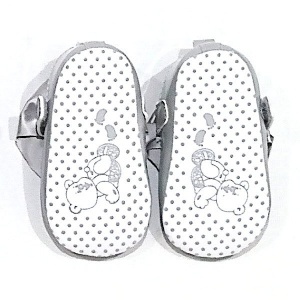 Baby girls light grey patent satin bow pram shoes, the perfect baby shoes for special occasions and parties. These beautiful baby girls light grey shoes in a shiny patent have a large light grey satin bow attached to the velcro strap fastening. A cushioned inside fabric sole provides extra comfort, with a soft and flexible outside gripper sole with teddy motif for pre-walking babies.